If the prospect of an evening filled with children knocking on your door to demand sweets doesn’t fill you with dread this Halloween, our annual round up of some of the horrors encountered by our MOT testers certainly will! The Addams Family’s Uncle Fester was famously bald. But he has nothing on some of the tyres that some of our testers come across. 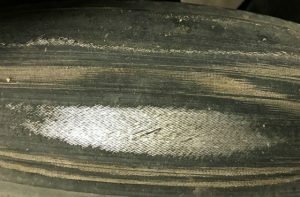 The vehicle must have been driven for several months with the tyres in this state. Its stopping distance would have been hugely increased and its grip seriously reduced. There would also have been a good chance of the tyre falling to pieces while being driven. As if this wasn’t scary enough, the car was fitted with two child seats! We all know that vampires can be killed with a wooden stake to the heart. But one motorist felt safe enough from vampires to use wooden stakes to replace one of his Mitsubishi Carisma’s front coil springs. Coil springs are a key part of the car’s suspension system. They help the tyres remain in contact with the road to ensure the vehicle can steer and brake safely over a range of road surfaces. Two bits of wood held together with cable tie aren’t a good replacement for a bespoke spring. This car didn’t get a chance to fail its MOT – the garage refused to test it on safety grounds. We can’t always think of a horror connection, and this one’s bad enough not to need one anyway. We’ve all heard stories about too much filler being used in vehicle repairs. But general purpose sealant? And in this case they went the extra mile and put the container in too. This was in the near side rear inner sill of a Ford Transit, converted to a camper van. The tester found a leaking diesel pump as well as a number of “holes bigger than my two hands in the chassis rails”. He was particularly worried about one spot. He told us “I could see it was rusty with a visual check, only lightly poked it with my finger and it crumbled". 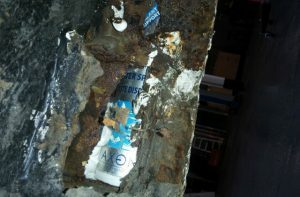 This then revealed the can. “Christine” was a car possessed by an evil spirit and had the ability to repair itself. That would certainly have come in handy in this case. The vehicle was driven to its MOT at the national speed limit. 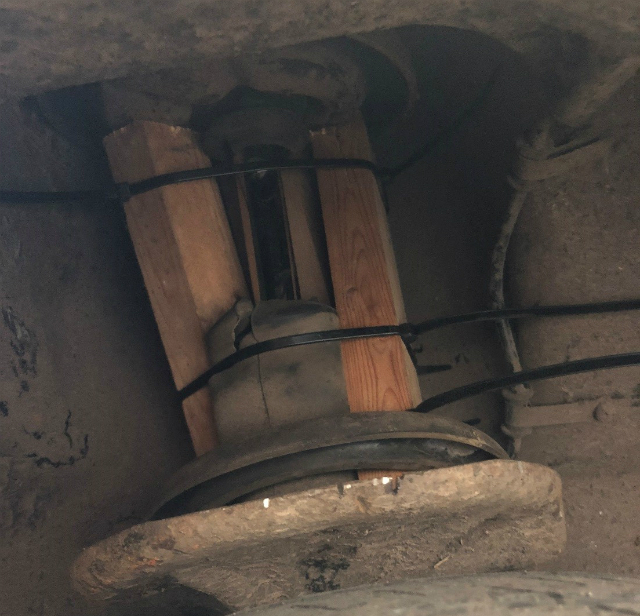 The driver didn’t know the ball joint on the top suspension arm had completely failed and the weight of the car was the only thing holding it together. The tester got quite a shock to see what happened when it was put on an inspection ramp. It was even more of a shock to the motorist. Of course, all of these problems were picked up before they caused an accident. These could so easily have been the cause of real horror stories, if it wasn’t for the great work done by MOT testers across the country. We’d also like to thank you all for sending us your horror stories. We’ve received almost 100 in just a few short days! We’ll be putting out another horror stories blog in the next few weeks with some other stories that didn’t make it in this time. I understand that some faults need to be carried out by Techs but, a lamp or wiper blade can be done at home by a DIYer so my question still stands how do you get a car home for a minor repair such as the above if it cannot be driven please? If your vehicle needs a minor repair such as that you describe above, you can take it home to do. You cannot drive a car home if it has been failed with a dangerous defect as the car will not be roadworthy. The car must still be roadworthy for the conditions when driven away. So, with minor repairs, such as a defective light in the day or wiper when it's not raining, in itself, doesn't constitute an unroadworthy at that time. If the light doesn't work when it's dark or a wiper when it's raining, the vehicle would be unroadworthy. The police could stop a vehicle they believe to be unroadworthy and take the appropriate action. if it’s dark and the light isn’t working, the police may charge you. If the same light isn’t working and its light, while the light isn’t working even though it should be, you won’t get a ticket. Apologies if this is how you've interpreted my reply. A presenter can take their vehicle away as long as it's done safely. If this means the car has failed on an aspect of the MOT where it can't be driven, alternative means must be used to remove the vehicle. You are correct in thinking MOT testing stations can't seize a vehicle. This has been explained in various blog posts and in comments on this blog. The rules are governed by each individual local authority, they decide any requirements beyond the minimum for their own taxi licencing. hi julia just to let you know so why do crawley borough council insist on failing taxis or private hire cars on tyres on 2mm limit the law states 1.6mm and below is a failure the so called hackey carrage department total brain dead all beyond me a joke. The MOT testing manual gives the correct information - you could point this out to them. DVSA has no control over local authority taxi administration. I carry out private hire tests where I work and would imagine it’s a similar situation to yours. Our local authority has ruled that at the time of the taxi test the tyres must be at least 3mm. The test is “piggybacked” onto the standard mot test and additional paperwork issued. We may see a situation where the tyre will pass the Mot (pass certification issued) but fail taxi rules: taxi failure paperwork issued. Seems straight forward ... unless they are typing the taxi fails into the standard mot failure sheet! thanks rick for that advice. leaking brake fluid/major fault/tyre below 1.6 mm dangrous do not drive.are you sure these are in the correct columbs. All vehicles should have an MOT every year whether the car is 1 year old or 50 years old. As mentioned, new cars can cover high mileages (my car has 140k in 2.5 years with a service every 24k miles) with drivers potentially having no knowledge of mechanics (both male & female). Then there are older cars that are exempt being driven by low income families finding it hard to feed the family let alone run the car - even if the above only accounts for 10% of vehicles on the road, it potentially affects everyone whether drivers or pedestrians. 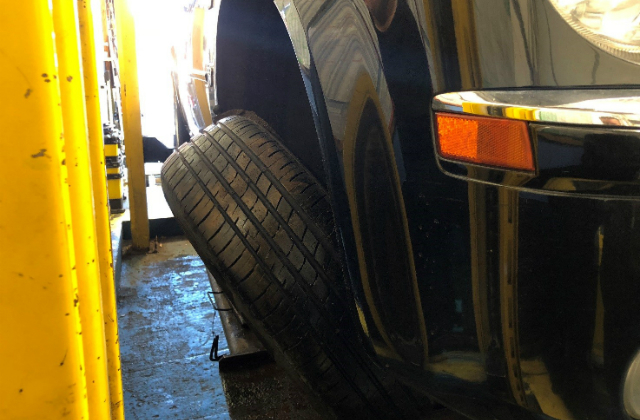 Too many vehicles are seen driving with 1 headlight or defective tyres but insufficient police to enforce the rules, so at least having an MOT once a year will make vehicle owners fix their vehicle! scarey thing is some testers don't know how gas shocks or coil springs function. I own a 1968 morris LD van which I believe is now ready for the road after a long restoration, It is going for an MOT as is still registered as a commercial vehicle and cannot have it changed to historic until an mot pass. I had a long search to find a garage prepared to undertake the job as a lot of staff had no idea of rules and regulations for this age vehicle, maybe they are incapable of repairs to old vehicles in this age of plug in computers. I work with classic vehicles everyday, we encourage our customers to have an mot regardless. Since this new rule has come in i have seen a number of classics now looking fantastic on the outside but rotten underneath. The newly owner of his first classic that knows nothing apart from his Dad used to own own one then finds that its unsafe for his three Granddaughters, no mot to back it up? Coil springs do not help keep the tyres in contact with the road , shock absorbers do that job. Springs only make the ride compliant. But if there are no coil springs then the dampers can’t do their job can they. And in any case the spring IS the shock absorber and the so called shock absorbers are really spring dampers! The springs are the shock absorbers,the dampers control the wheel movement ! Thank you for your reply, I have looked at the site you suggested and it says "YOU cannot drive" until the faults are repaired, a typo? The rules are (as I understand them) if you take the car in for MOT less than 28 before your MOT runs out you therefore have "27 days" to carry out the repairs so that you can preserve the MOT date. That aside my question is how do I get the car home (which still has some time left on the existing MOT) to carry out the repairs if I cannot drive "IT" until the repairs are done please? I do have a rigid bar and tow car available but I do not have a car transporter trailer to carry my car. In the case of a dangerous defect, you would be able to tow the car to a place of repair. A car that has failed with a major defect must be repaired as soon as possible. It can only be driven to a place of repair if the defect it has failed on does not cause the car to be unroadworthy. Hi Julia is it okay to tow a vehicle on the road even with dangerous defects! It would depend what the dangerous defect was. For example, if the chassis has caused the MOT fail and it’s not strong enough to attach the towbar to, the vehicle would have to be recovered on a truck. All these problems picked up before an accident due to the m.o.t test yet if the vehicles where over 40 years old there would be no test needed, makes no sense at all, really wish someone from dvsa could explain why this rule has been brought in. The Department for Transport consulted on exempting Vehicles of Historical Interest from roadworthiness testing before the changes were introduced. Statistics then, on the first day this ridiculas rule came in we had a vehicle over 40 years old presented for test, it was one of the longest failure certificates I've printed off all year, good job the custemer had the common sence to bring it for m.o.t. Having read the said gov document on consultation the stand out reason seems very easy to see. The cost in time and money for a small section of society who run classic vehicles. As an NT and AE and owner of classic motorcycles I have to say that the stats used are used in a way to justify a policy that has been implemented for the few. As a responsible road user I find it wrong to not have my classic machines tested and have a second pair of eyes check my bikes, not least to give me piece of mind to know they are fit to ride. It strikes me that this was a politically motivated move and not looked at holistically. Not that this is a surprise politics and government have a tendency to do this to our trade and then move in the opposite direction with other trades. . . . . I will continue to advise customers that while the MOT on their classic bike or car is no longer legally required they still have a legal duty of care and the test fee is a small cost to pay to show that they have taken that duty of care seriously. Stark contrast to our government. I agree. I have a fifty years old car and it is in tip-top condition, however when I am out and about at different club meetings and shows I am amazed at the levels of incompetence of repairs on older, ‘classic’ vehicles that do not require a DVSA roadworthiness test. I cannot for the life of me understand how insurance companies allow a vehicle to be insured without even the most basic engineers report (for that is what an MOT test is)! I have been in the trade for over 19 years, from cars to busses now trucks and trailers, a vehicle should be presented for MOT, it is an embarrassment if a vehicle I prepare for MOT fails, not just for me personally but for who I work for, I know it's different for HGV as operators licences are involved and a failure will affect a company's operators licence but how about a system like this for car owners, your car fails on dangerous items and this all gets recorded and tied into insurance costs, this will force owners to get their cars looked at before a MOT and make their vehicles safe! Just a idea! That's because of the disgusting state of UK road surfaces. It's throwing money away. I have been replacing my Citroen Picasso HDI with low cost tyres for years with no safety problems. You may have guessed already I live in West Sussex(potholes repaired by cave rescue)? A friend had a no fault accident recently in an MOT exempt classic car. One of the first things the insurance asked for was proof of MOT. the car tested three weeks previously.This kept the insurance happy. How else can you prove that the car is roadworthy? done,the old cars would have to come back to us. An MOT is not proof of roadworthiness but its better than nothing I guess. Can we really put a cost on peoples lives for the cost of a MOT,every year it needs a examination.If its one year old or fity years old it makes no difference it can still kill. !Commercials every year whats the difference. I believe that if a car is deemed unsafe, the m o t Station should organise a fixing for the vehicle&the cost presented to the dvla, as most of the wear&tear&damage to car parts is through bad road maintenance which we pay high Rd tax for which ain't being fully spent on roads!! Road tax doesn't pay for road repairs, it hasn't since the late 60's, your council tax pays for road repairs. Their are cars on our roads that don't pay any so called road tax at all. I am told that if your vehicle fails the MOT (even for a lamp) you can not drive it home to repair it, will a "rigid bar tow" be legal please? I have spoken to a friend who took his car to "his man" who drove it to the MOT, it failed the MOT "his man" then drove it back to his workshop to repair it, do the trade have exemptions? Please see the information on this page: https://www.gov.uk/getting-an-mot/after-the-test in the section on 'Failing the MOT'. Servicing , MOT and repairs should be only carried out by qualified techs at the same time MOT'S SHOULD BE KEPT YEARLY ! for all vehicles regardless of age or mileage .Only in this way would we ensure that road worthy SAFE vehicles are on our roads. As most of the others have said I've seen some real sights in my 25 years in the trade its scarey what death traps are out there whether there botch jobs or mod's .Ignorance and a distinct lack of knowledge is an accident waiting to happen. I once did a 1st test for a regular customer, a Berlingo van, I sat in the car for a good few minutes checking the mileage, I was looking for the decimal point because i thought I was looking at the trip meter, it was showing 299000 miles at 1st mot, something needs to change, it was a tnt van, family driven 24hrs a day!!!! And how is the average motorist going to know what is or isn't roadworthy? That's what the MOT has always been here for. Telling people they have a 'duty' means very little if they know little or nothing about what they are looking at in the first place. Tucked away items that are unseen is perhaps understandable. Items fully visible and those affecting how a vehicle handles are not the driver cannot claim ignorance but people just do not think or understand. Let’s introduce mandatory teaching on car mechanicals. Then we might get better understanding. Or MoT every 6 months for all vehicles. I think the dvla should pay for faulty tires, suspension parts&bust bulbs as its there duty to make sure our roads are safe&well maintained, they are not spending all road tax money on roads that are damaging our cars, so they should be held responsible for costs, M o t stations should have the power to present dvla with repair bills for peoples cars due to bad roads, the testers know the difference between neglect&what is caused by bad roads!! What about vehicles that aren't old enough for an MOT but have very high mileage. Shouldn't we have a mileage factor as well as time for vehicles under thee years old. Wear and tear must be considered surely. I would imagine cars under three years old covering high mileages will be on a good servicing plan. Lets hope. Most of the things that cars are likely to fail on are age related; rusty sills, rusty brakes, perished suspension bushes, perished CV and ball joint boots etc. Safety-wise, things that'll be mileage related tend to be obvious like tyre and brake wear or suspension wear that makes the car drive like blancmange on casters. Emissions related things are probably governed more by mileage than age. The other side of the equation is that people who can afford cars that are less than 3 years old can afford to have them professionally serviced, usually at the dealership, where the pros will try to find everything that could conceivably be wrong with the car in order to make money out of it. If the" pro's "find a fault at a dealership on a car newer than 3 years old it would usually be covered by manufactures warranty.No really a making money out of a customer exercise!!! First 3 years of a cars life you don't need an Mot (at least that used to be the case). The comment regarding the missing coil spring and its job to keep the tyre in contact with the road is true yet we have to pass and advise a shock absorber that has no damping effect, which when combined with a working spring is a very dangerous combination, I've had several since the the rfr was removed from the test some years ago and always find it ridiculous something so dangerous can not be failed. 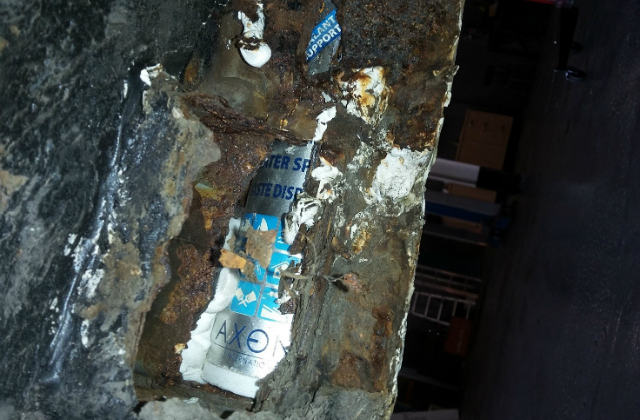 In all the cases we've come across there has been no leakage (gas shocks) or excess corrosion/damage. Was it not the absence of a spring that was the issue? If that was so, then failure, or if it were me - refuse to test. Sorry Ive missed what the point is about the gas damper ? not in march cambs. area, we tested a lot of old cars until the mot exception came in now we do not see any mot exempt cars at all ,I rest my case. How often do people check their car? Most people will only check oil and water andleve the rest to garages. we test many classic cars in our garage and up to now most have bought their cars in for the annual test lets hope the owners see the sense and importance of this practice. as your horror stories our garage is in a fairly low income area and a lot of people seem to think the MOT is all that is needed. I have seen some right horrors over the years i must start taking pics. Totally agree with glenn above. If that suggestion had been accepted those tyres shown here would have gone on for another year, maybe! Even if vehicles don't need an MOT because they are over 40 years old or otherwise exempt, motorists have a duty to make sure they're not driving an unroadworthy vehicle. Many owners of these vehicles take them for an MOT anyway. This whole blog is literally about how vehicle owners can't be trusted to keep on top of basic safety critical maintenance. The MOT exemption really puzzles me, because if you think responsible owners will take their car for an MOT anyway, then you aren't saving them any money, and the only result of the policy will be that owners who don't care whether their car is roadworthy will face no inspections. For what it's worth, the 3 year MOT exemption for new cars is far too long too. and they were thinking of doing m.o.t's 4 - 2 years.